Have one camera at home is not enough,so i want to buy a 4 channel system for my home use,still not sure which one to buy,but the saler is very friendly to talk to me. I would recommend this affordable home security system to anyone looking for a security camera setup. It has all the features that you need from a DVR and the support team is completely awesome. They will help you get everything setup for remote view if you have any problems doing it yourself. I'm satisfied with this top rated system for its dvr and cameras,however,when I installed this camera, all my other cameras stopped working. Oops. I had a lot of frustration, but in the end, all I had to do was reset all the older cameras by pressing a very tiny button through a very tiny hole on the back of the cameras. Then, my system rediscovered all the cameras and I was back up and running. I have searched the Internet for years to find the best prices on security dvr system equipment. It seems like my search always takes me to the HoneSecuirty361. Always top notch and always fast shipping. This is an exceptional deal. The cameras are of decent quality, the DVR is ready for you to install your SATA drive (up to 2TB) and the remote does everything necessary. Can access video monitoring via web browser, Android, iPhone, external VGA monitor or composite video input on a standard television set. Best part of this deal is that there are four remaining camera inputs for future security cameras. We offer you the best value in the industry on our Complete Surveillance Systems. Choose from any of our indoor and outdoor camera CCTV kits. Whether you choose our 4 channel Surveillance System for a home security, or you go further with our 8 channel Surveillance System or 16 channel Surveillance System for CCTV surveillance at home or for small business, you can't go wrong. There are many features to consider when you are designing your CCTV home security systems. 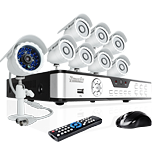 Our store pre-package in 4,8,16 channel security system and can be configured to meet your exact CCTV security needs. 4 channel surveillance system: The 4 channel CCTV camera system is perfect for residential or small business application that will get important premises and families protected. Most of the latest features of all our other DVRs are included in this unit, just changed in channel. We didn't cut any functions to meet a lower price but still our price is very cost-effective. The 4 channel CCTV DVR system can record CIF resolution at 30 fps on every channel or D1 resolution at 7fps on every channel. All of our DVRs share the same interface and GUI so if you know how to use one, you know how to use all. All of our 4 channel DVR systems can control PTZ via RS-485 port, which gives you more options of cameras to be compatible with. With an installed 500GB-1TB hard drive combining with the state-of-art h.264 video compression, the pre-packaged 4 channel security camera kit can record from 2 weeks to one month. You will never need to worry about the storage of the video footage. These systems are networkable, allowing you to easily monitor your home or business remotely via the internet. All of our video security systems are easy to install. 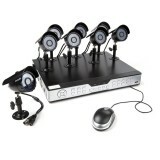 8 channel security kits: For only a little bit more money, you can upgrade to our 8 channel security kits. Our three types of outstanding digital video recorders are like brothers to our 4 channel DVR system. Each type of similar name shares the same interface and GUI, but can allow more cameras to connect with it. These DVRs will work with almost any PTZ security camera. These CCTV security systems are ideal for any size of residence and small businesses. If you can not decide between you want 4 cameras or 8 cameras, just pick our 8 channel security system with 4 cameras for security , and in the future if you really want another 4 cameras, you don't even need to change your DVR, just add 4 CCTV cameras. Our package setting has made security easy. 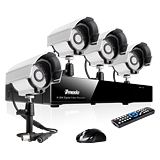 All the packages include a CCTV DVR recorder, cameras, power supplies, and even video cables. It includes everything you need to get everything ready to hook up a home CCTV system. If you already have a hard drive at home, you can buy our system with no hard drive, or else, you can buy our 8 channel surveillance kits with 500GB-1TB hard drive to extend your storage. These systems also support remote viewing from Windows PCs, iPhone®, Android™, and iPad® mobile devices, which enable you to monitor your home or business whenever you want. 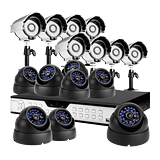 16 channel security kits: Our CCTV surveillance camera systems come pre-package in a 16 channel DVR with or without a hard drive, 4,8 or 16 security cameras, and some essential security accessories which can be configured to meet your security demands. This 16 channel security system is suitable for large areas, like airports, supermarkets, public places, and so on. It is also networkable, allowing you to monitor remotely via the Internet or a Smartphone from anywhere in the world. These three kinds of surveillance systems are good for CCTV monitoring no matter whether you are there or not, it helps deter crimes, and provide evidence when crimes happen. Peace of Mind: All video security system packages come with a 30 day money back guarantee, a minimum one year warranty, and free lifetime technical support.